ObamaTrade returns on Tuesday – Call Congress 202 224-3121 tell them Vote NO! 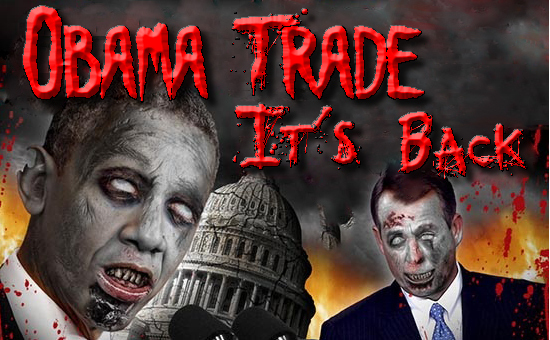 The House of Representatives will vote on Obamatrade – again! – on Tuesday. Call 2o2 224-3121 – tell Congress to vote NO! John Boehner and Barack Obama are pushing H.R. 1314, that will give Obama the power he needs to enact Obamatrade, the secretive TransPacific Partnership. In addition, H.R. 1314 will also raise taxes on small businesses to fund a wasteful welfare program for union members. Tell your congressman to vote No on H.R. 1314 when it comes before Congress this week. A vote for H.R. 1314 is a vote for Obamatrade and a tax hike on small business.